Giantex Patio Umbrella Base Stand Cast Iron Outdoor Deck Porch Lawn Garden Market Standing Holder Square Heavy Duty Cast Iron Umbrella Stand Outdoor Base (17.3”) by Giantex at Lawn and Garden Mart. MPN: Patio Umbrella Base Stand. Hurry! Limited time offer. Offer valid only while supplies last. Description: The umbrella base is stylish and functional. This is alow maintenance piece that is rust-resistant, providing for longer use. The umbrella base is stylish and functional. This is alow maintenance piece that is rust-resistant, providing for longer use. 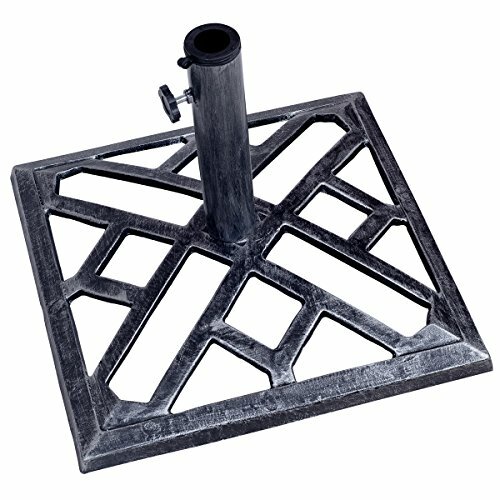 Withclassic ornate cast iron effect, it would make a great addition to any garden.Weighing in at approximately 18lbs, this base features a secure and robustdesign suitable for use throughout the year. This base avoids hassle of fillingwith sand or water, convenient to use. Includes a coupler to allow it to fit 38mm to 48mm (by removing theadapter) in diameter umbrella poles. Perfect to be used with Patio Wood Umbrella, Iron Garden Umbrella,Aluminum Patio Hanging Umbrella etc. Don't hesitate to add it to your cart! Round Base Size: 17.3 "
【Heavy Durable Cast Iron】The cast iron as the main bottom material, is super heavy duty and has strong support, perfect to hold all types of umbrellas. 【Heavy Duty Base】Weighing in at approximately 18lbs, this base features a secure and robust design suitable for use throughout the year. 【Coupler Included to Fit 38mm to 48mm】 Includes a coupler to allow it to fit 38mm to 48mm (by removing the adapter) in diameter umbrella poles. 【Fit All Types of Umbrellas】Perfect to be used with patio wood umbrella, iron garden umbrella, aluminum patio hanging umbrella etc.